How long did Lon Chaney's unmasking prevail as the screen's Great Scare Moment? Did it last through a public's willingness to watch movies in black-and-white? There were years waiting before I finally saw it (back when just one or two of those amounted to an eternity). 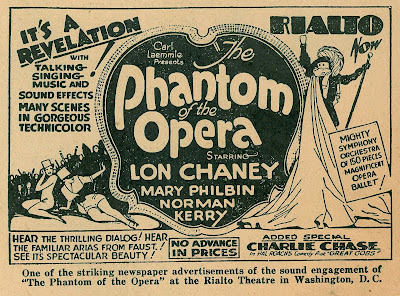 Everyone's parents or grandparents recalled the Phantom from first-hand exposure or knew someone who'd encountered him in theatres. 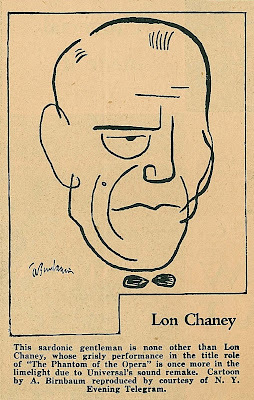 This fiend in the guise of Lon Chaney (or vice versa) was by far the most famous of monsters. The magazine spun off that designation offered 1925's crucial moment on a one hundred foot 8mm reel for five dollars. 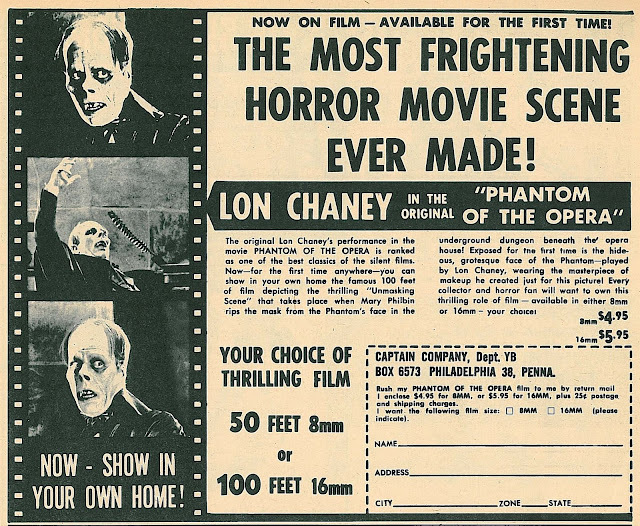 The Most Frightening Horror Movie Scene Ever Made was a declaration no one challenged in the mid-sixties when first we spotted the (above) ad. Getting up the sawbuck was something else, for that amounted to ten weeks of allowance, at least for me. Maybe it was better imagining what the big reveal would look like. Certainly we'd seen this Phantom sans disguise, for seemingly not a monster magazine went to press without his image on the cover or elsewhere within. Remarkable that a face then forty years past creation, its enactor dead nearly as long, would so dominate young fandom's consciousness. 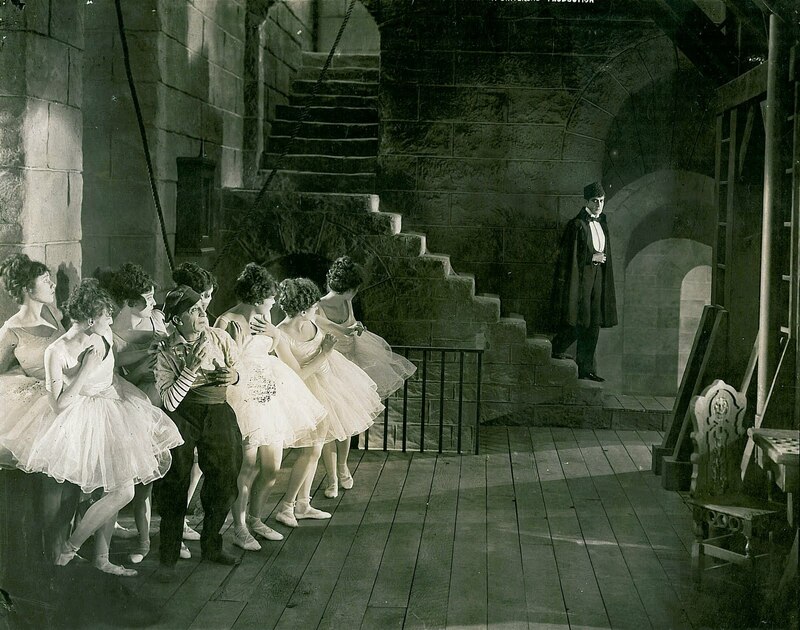 I'd say without fear of contradiction that Phantom Of The Opera is the most popular and widely viewed of all silent dramas. Can anyone name another that comes even close? What attached us to this character even as the movie remained so beyond reach? 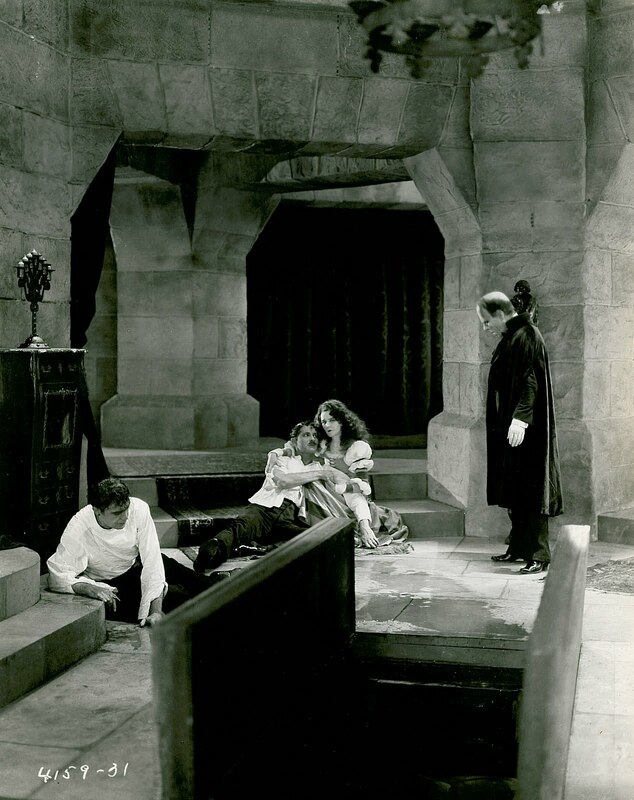 Castle Of Frankenstein's selling arm Gothic Castle offered Phantom Of The Opera complete in 8mm for $41.95, but how could we trust Calvin Beck with that kind of money? More within grasp was Aurora's plastic model for a dollar. I could never get the cape to remain aloft despite repeated application of Testor's glue. A cruelest nature (at least mine) emerged when garnishing the prisoner whose screaming visage adorned the base. I slapped blood red liberally across that face and regretted lack of more explicit means to convey his suffering. Maybe Aurora sensed my need, for in no time there were customizing kits with rats, skulls, and sundries with which we could accessorize models otherwise completed, but lacking a finished touch. I've heard more than one enthusiast call the Phantom his (were there any hers?) favorite of the Aurora group, and I'd venture credit went mostly to that wretched figure behind bars (box art above misleads for showing him at eye level with the Phantom). Maybe parents were justified in their concerns. Certainly there was basis for elder trepidation when Aurora later offered its Guillotine model with sliding blade and detachable head. I took particular relish in applying blood to both stumps and conducting executions ad nauseum for those willing to join me at the tumbrel. The thing that lit up Blackhawk Films' Phantom release was their inclusion of the fabled color sequence long thought lost. This was excitement unparalled for 8mm collectors during the early 70's and a visual grabber near equal to the unmasking scene itself. Source material for Blackhawk's print was a 1930 reissue version that Universal adapted from its original of five years before. This newer edition began with a shadowy figure voicing introduction as he lurked about catacombs with a lantern. The scene was interminable and not helped by fact we heard nothing of the spoken prologue, these being silent prints Blackhawk was selling. More than once I uttered muted prayer that restless audiences would remain seated rather than bail on this opener. Why didn't I just apply scissors and lessen the agony for them? The purist that guides all collecting paths forbade that, of course. It took years realizing that Phantom Of The Opera circulated in many forms, virtually none authentic to what Universal initially shot in 1925. Their starter version was said to be too horrifying for a timid public's consumption, so out went baser shocks and in came clowning relief with Snitz Edwards and others to becalm spectator nerves. Still this Phantom freaked out a generation and many to come. There was even more color in early prints, but with exception of Blackhawk's discovery, they've vanished since. Universal recognized Phantom Of The Opera as super-est of jewels and got out that refurbished edition in early months of 1930 to capitalize on operatic potentials of a soundtrack newly applied. A good deal of fresh content was shot and even romantic leads Mary Philbin and Norman Kerry were back to record dialogue (their stuff now lost too). Much has been written about the film's jigsaw history by experts who've done books and special edition DVD's on the subject. Certain of these Phanto-masters have dedicated lives to the pursuit. I can well understand their compulsion, for Chaney's handiwork and the film's checkered history has more than once lured me with its siren call to further exploration. 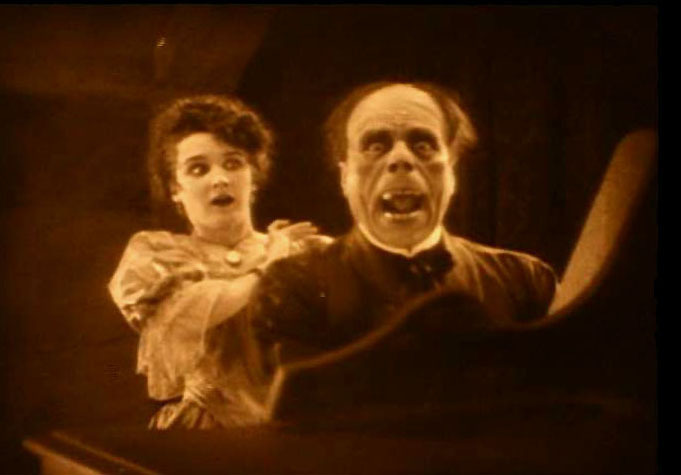 I wish Screen Gems could somehow have gotten Phantom Of The Opera into their "Shock" package for TV. That would have put it among other Universal horror greats and given fans earlier access. As it was, even the 1943 remake was excluded from SG's group. Buying a print was about the only way you could experience the 1925 Phantom. Of course, that only enhanced its caché. 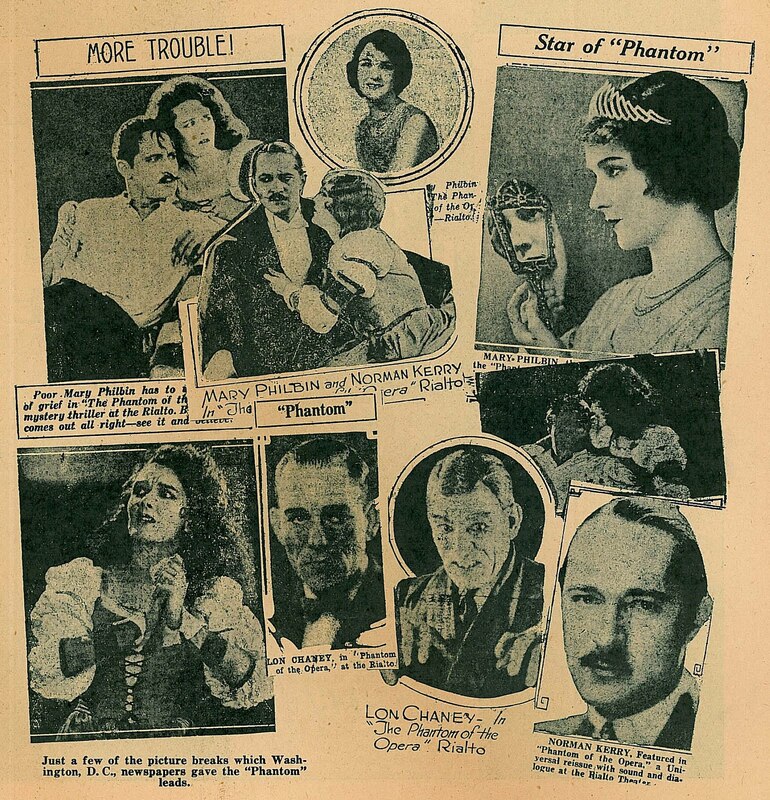 The property's rebirth as a Broadway musical kept audiences aware and spurred interest, or at least curiosity, in Chaney's original. I always drew crowds screening it, certainly more than to silent programs generally. Modern viewers tend to enjoy Phantom Of The Opera and certainly they respect Chaney (there's almost a sense among the uninitiated that his monster is the real thing rather than an actor's impersonation, not unlike reaction to Max Schreck's Nosferatu). As with most vintage creepers, atmosphere and art direction easily trump comic relief there to undercut it. Those Phantom sets are just too imposing for anyone not to take seriously, and no amount of cutting or re-shooting was ever going to mitigate their effectiveness. Refreshing too is 1925's resolve not to soften the character as remakes would. He's identified bluntly as an escapee from Devil's Island well versed in the black arts. 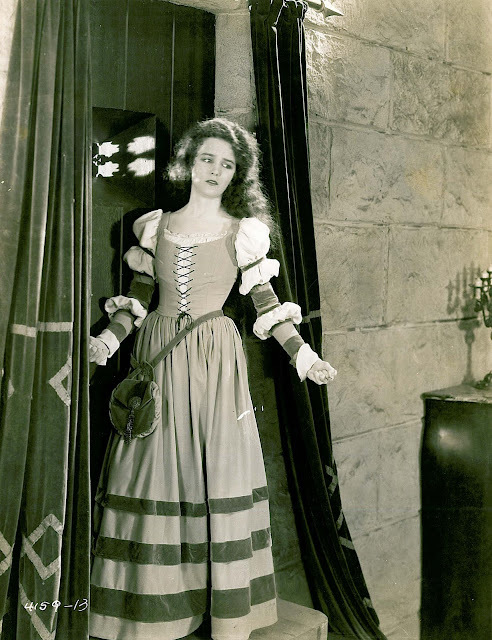 Whereas Susanna Foster futzed over a pathetic Claude Rains in 1943, the original's Mary Philbin comes right to the point and addresses her Erik as a loathsome monster. Time's not wasted on motivation for this Phantom ... he's deranged and altogether unmanageable. We need not the acid splash to get his engines rolling. Sometimes (maybe always?) horror plays best when relieved of nuance viewers are better thrilled without. 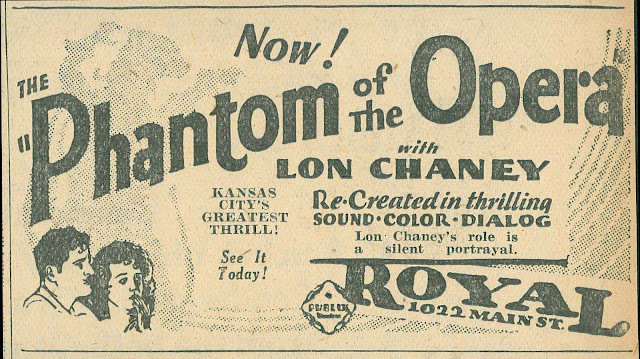 Could its welcome simplicity be (further) reason Chaney's Phantom Of The Opera survives best of them all? I had the same AURORA "glueing the cape" problem with Superman. I haven't thought about Aurora movie monster kits in years and doing so brought a smile to my face. I wonder how different Phantom would be if Norman Kerry wasn't playing Mary Philbin's love interest. I'm sorry, but the guy comes across as a bit of a twit. He is just what John Barrymore would have been if Barrymore did not have charisma, talent, and a strong masculinity. There was a moment in the late 60s when one of the model companies -- not sure if it was Aurora -- marketed a full line of torture chamber models not related to any specific monster or franchise. The uproar was immediate, and "Rowan & Martin's Laugh-In" cheerfully mocked the toymakers with one of their dubious awards. The parental outrage repeated itself when the R-rated Alien and Jurassic Park movies spawned toys and cereal promotions clearly aimed at much younger audiences. The Jurassic Park line had a particularly interesting gimmick called "Dino Damage": a piece of each dinosaur's skin would snap off to reveal dino guts within, so you could simulate battles with carnage. There was even a human figure with a matching snap-off arm. After some bad publicity they added a strange text disclaimer to the commercials. I recall it said "Choose Movies Wisely" or something equally ambiguous. 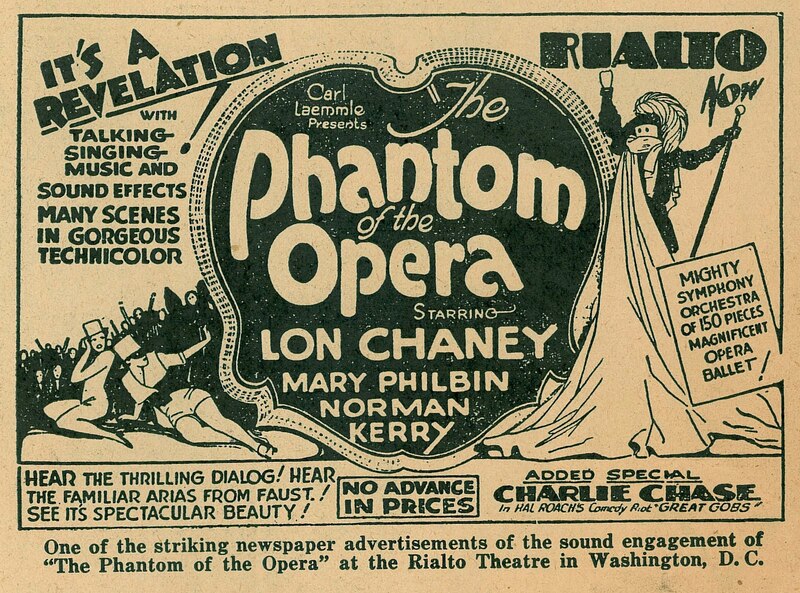 As for Phantom, my experience has been that live audiences mostly respect Chaney but laugh at everything around him. The two biggies came when the hero and the cop in the fur hat sought out Erik's lair: First, the whole business of keeping a hand in front of your face as defense against strangling. Second, when the creepy stranger with the lamp walks by with his cryptic warning. Evidently he was a character in the original cut, a rat catcher who roamed the catacombs like a zombie Pied Piper. Now he's literally a walking cliche, the sort of one-shot gag you'd expect in an Abbott and Costello movie. 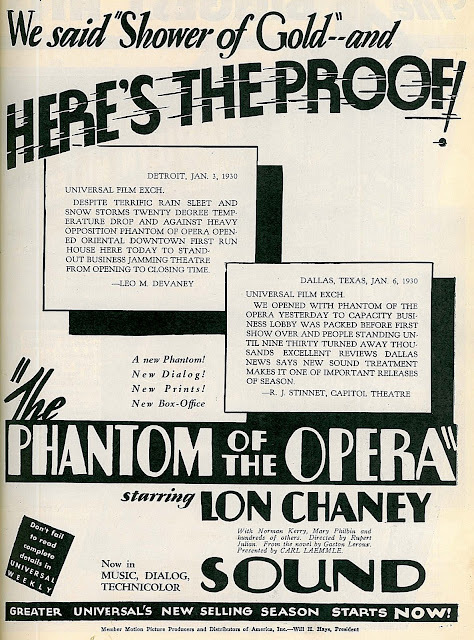 Does anyone have an opinion as to which "Phantom" DVD currently available is the one to watch? The Milestone set has great extras including selections from the soundtrack discs, but is compromised by a poor PAL\NTSC transfer. The torture chamber kits were the Aurora "Monster Scenes" (1972). There was a Frankenstein('s monster), Warren's "Vampirella", Dr. Deadly, The Victim, The Pain Parlor, The Pendulum and others. "Phantom" was my favorite Aurora monster model, too! I remember sweatin' thru those long winded Paul Killiam informative title cards on Blackhawk films,by the hot lamp of the old super 8 projector while it clatterd away and wondering how long before my audience bails also..
Kevin K.: Personally, I'm quite happy with my Milestone Films DVD set. 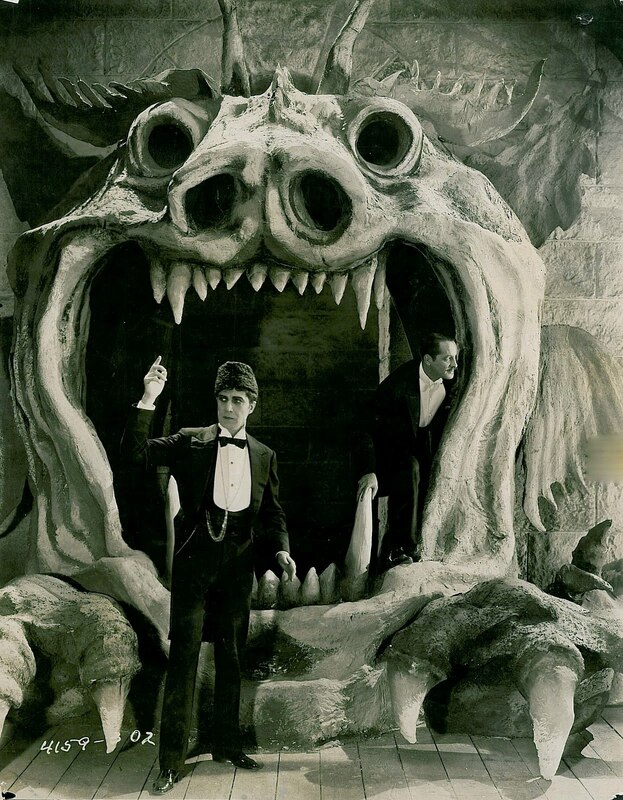 I only wish we could get a restoration of the original 1925 version (I do prefer the continuity of that edition) to match the 1929 reissue; the '29 version survives in a very good 35mm print, and the restoration includes tinting, Technicolor, and an orchestral score by Carl Davis. The '25 version is only a battered 16mm reduction print (or compiled from more than one) in flat b&W, and that's it. The latest David Shepard version Scoundrel cites does sound tempting, however, and I may check it out myself. I'm glad you were able to get your Guillotine blade to fall John. Mine never would slide inspite of my every effort! Maybe I had too much blood paint on the blade. Your post transported me back to that magic summer of '64. Like today, then, too, it was a miserably hot day outside--but I was a nine-year-old boy down in a cool, musty basement examining a cardboard box which contained an unholy reliquary: "THE SKULL, LIZARD & RAT" Aurora Customizing Kit! The usual graveyard accessories of pale gray styrene plastic : a thumb-sized human skull and assorted disarticulated human bones, a lizard, rat, bats spiders, tombstones, etc. I'd already "built" most of the monster series. I never followed the instructions on "How to Make a Monster". Who had the patience to paint the separate pieces BEFORE assembly? Not I. (Maybe a few perfunctory dabs of Mom's Scarlet Sunset nail polish on a talon here, a fang there). Gloopy spurts of Testor's glue trickled between the seams of the models; stray strands of the sticky cement floated atmospherically like broken cobwebs over tableaux of Frankensten and Dracula and the Mummy and Wolfman. Tripping from the collateral psychedelic fumes of toluene, my fingers were stuck together until the dawning of the Age of Aquarius. Years went by. One day my mother threw all my monsters away. O-Bla-Dee, O-Bla-Da. Life goes on. Remember FRANKENSTEIN'S FLIVER and DRACULA'S DRAGSTER? 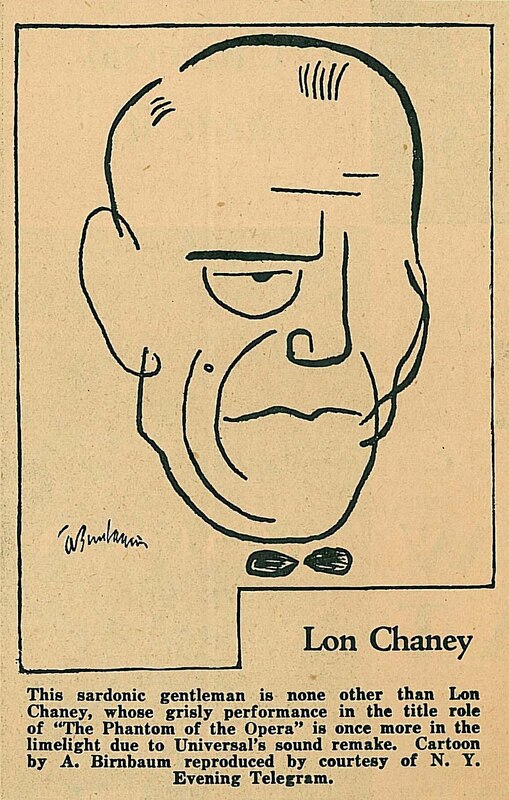 Beautiful caricature of Chaney! Abe Birnbaum (American, 1899-1966)was one of the best cover artists the New Yorker ever had! Bought the Super 8 Phantom in July of 1973. 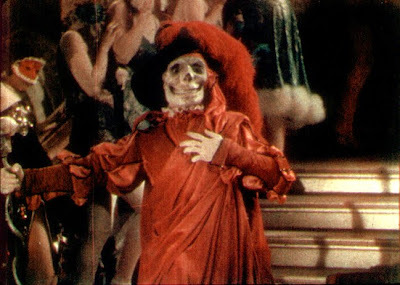 I believe the technicolor Bal Masque footage was offered a month later. I attempted a similar presentation at the local library with more favorable results.At least, I didn't have to deal with drunks. 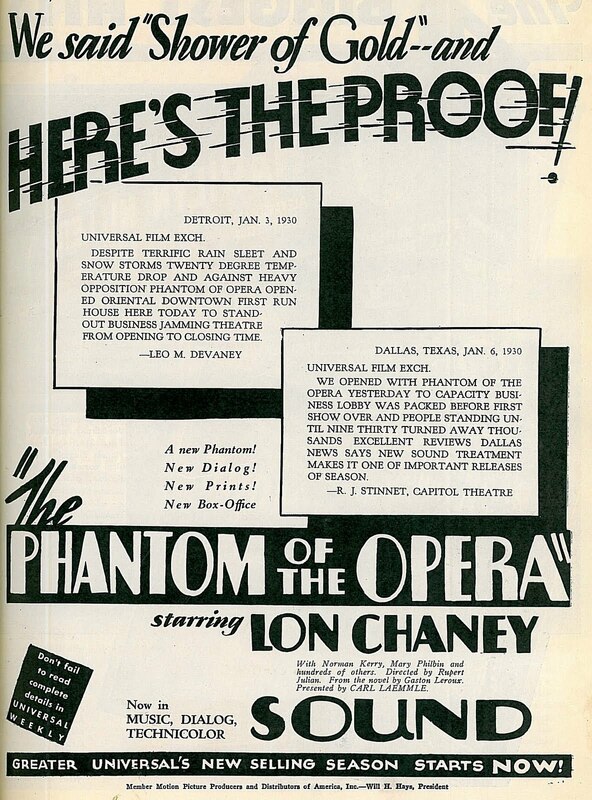 Good to know I'm not the only person collecting Phantom pix, magazine articles, and newspaper ads.